Follow the trials and tribulations of Henry Fleming, a recruit in the American Civil War in this impressionistic novel by American writer Stephen Crane. Considered one of the most influential war stories every written, The Red Badge of Courage was published in 1895, a full thirty years after the American Civil War had ended. 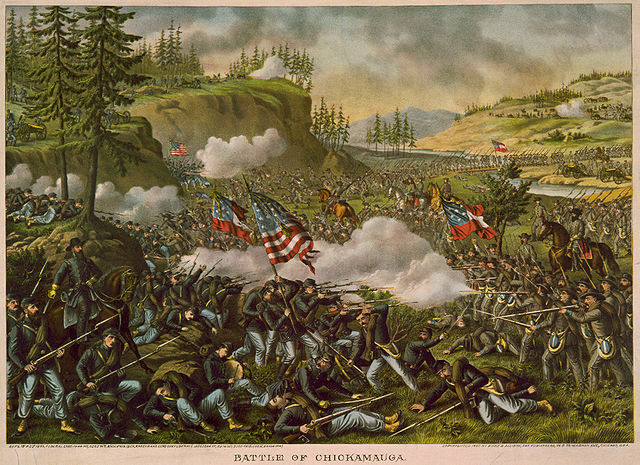 Although Stephen Crane was born after the war and never participated in battle himself, he was highly praised by the Civil War veterans for having capture a realistic impression of their actual battlefield experiences and emotions. The Red Badge of Courage treats with the meaning of courage as the young protagonist, Henry Fleming, is cast into a literal "trial by fire" that will take the full measure of his courage. Crane carefully traces the development of our young soldier, detailing the hopes and fears and rationalizations of his career. When this novel has been completed and discussed, thoughtful teachers, students, and readers should turn their attention to Crane's "uknown sequel" to the novel; a short story centered on Henry Fleming later in life that allows Crane to get in a last word on the meaning of courage and character of Henry Fleming; The Veteran. Featured in our collection of Civil War Stories and 25 Great American Novels.